This advanced formula delivers deep exfoliation in just 2 minutes. 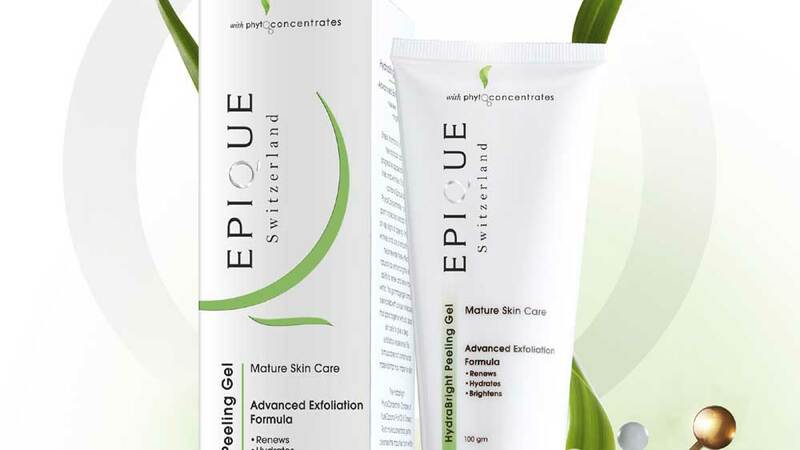 Epique (Switzerland) has launched its 'Hydra Bright Peeling Gel', a natural exfoliating gel with unique gommage action, specially developed for mature skin care. This advanced formula delivers deep exfoliation in just 2 minutes. Unlike chemical-based peeling gels, this natural turmeric and coconut based formula provides deep cleansing without irritating the skin. It is enriched with unique molecules that exfoliate by adhering to old and dead skin cells, as well as impurities, leaving the skin feeling renewed, hydrated and brightened. Packed with Epique's Hydra Bright Phyto-Concentrate Complex of Pure Coconut Fruit Oil & Turmeric Root molecular extracts, this formula gently cleanses the impurities from within the pores without leaving the skin feeling tight, dry or irritated. It makes the skin look instantly softer, brighter & clearer. Epique's Hydra Bright Peeling Gel formula can be used once or twice a week on dry face and neck. It needs to be gently massaged on the face in a circular motion for 1-2 minutes to roll, lift and sweep away dead skin cells and impurities. About Us: BlueStone is India's No. 1 online destination for designer..
About Us: Kathi Express has discovered its own variety of spices..